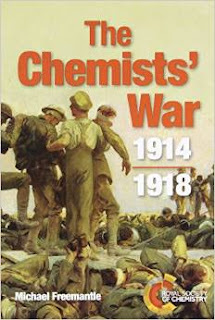 I was surprised to find that only one of the chapters – Chapter 13: 'The World’s First Weapons of Mass Destruction' – is focused entirely on chemical weapons and their use in WW1. The subject crops up in other chapters, but only as part of a broader context. For example, Chapter 12 is a 30-page biography of Fritz Haber, Germany’s unrepentant 'father of chemical warfare', but only six pages of it deal with his activities during the war. Chapter 14, about mustard gas, starts in WW1 but then fast-forwards to WW2 and the Bari tragedy. The title of Chapter 1 is 'Much More than Chemical Warfare', and that could really have been the book’s subtitle. Explosives are chemicals too, after all, and chemists were in demand to keep a step ahead of the opposition in this area too. Sometimes the link between a problem and its solution was far from obvious, and it’s here that the book can often become unexpectedly fascinating. Why did the British government suddenly urge children to collect conkers (horse chestnuts) for them? The answer was a state secret, but it came down to the fact that they could be converted into acetone – a key chemical needed in the manufacture of cordite. There was also a sudden upsurge in the demand for whale blubber, which could be used to make nitro-glycerine, and even chamber-pot urine, which proved to be a useful source of the nitre needed to make gunpowder. Although the author is a professional chemist, this is very much a history book rather than a science book. 'Chemistry', as far as this book is concerned, simply means 'chemicals' – and chemicals are always referred to by name rather than formula. There is nothing about chemical reactions, and no explanation of why certain chemicals have the effects they do. Personally I was disappointed by the lack of scientific explanation or insight the book provides, but I guess that for a general readership it’s safer to err on the side of too little technical detail rather than too much. The blurb on the back cover says 'The book will appeal to the general reader as well as the many scientists and historians interested in the Great War' – and I wouldn’t disagree with that.